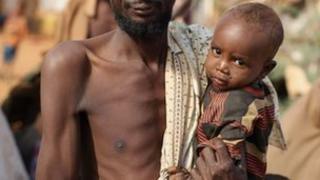 Famine-hit Somalis could lose access to up to $100m of remittances from relatives in the US, charities say. They urged a US bank and the Treasury not to disrupt money transfers to Somalia, where more than a quarter of a million people are at risk. The Franklin Bank is thought to be the last major US bank to offer remittance services to Somalis living there. But it says it will stop the service on 30 December because of US counter-terrorism regulations. The US Treasury said banks had to observe diligence rules but that there was "no assumption on the part of the Treasury that money transmitters present a uniform or unacceptably high risk of money laundering". Oxfam America wants the bank and hawalas (money transfer businesses in Somalia, where there are no banks) to work with the US government to find a solution. "It is estimated that $100m in remittances goes to Somalia from the US every year. This is the worst time for this service to stop," said Shannon Scribner of Oxfam America. "Any gaps with remittance flows in the middle of the famine could be disastrous. The US government should give assurances to the bank that there will be no legal ramifications of providing this service to Somalis in need." It is thought that when Franklin Bank stops the service, smaller banks might follow suit. They would fear being held responsible if money fell into the wrong hands, such those of al-Shabab, an al-Qaeda-linked militant group. "With famine and drought already impacting families throughout Somalia, the cessation of bank transfers will be devastating on a national scale", said Daniel Wordsworth, president of the American Refugee Committee. Oxfam spoke to one mother of six in Lower Juba, Somalia, whose brother sends her money from the US. But he called a week ago to warn that he would be sending the last cash as the hawala might stop working. "My family is relying 100% on that cash and if it stops, we have no option but to move to Dadaab refugee camps in Kenya," Habiba Abdi Ali said. The US Treasury said it "engages regularly with the Somali-American community" to "promote the continued use of legitimate and transparent methods" of remittance. It said it believed the community would continue to have such methods to transfer funds to Somalia.